Inaccessible or mobile outstations that do not have access to the telephone network or ADSL can be integrated into central networks using the DSR-211-L LTE / UMTS router. In this which is available worldwide. Theoretical speeds of up to 100Mbit/s in the downlink and 50Mbit/s in the uplink are possible via LTE. Secure connections between your outstations and your control centre can be established using VPN. The “Dual SIM” function ensures a fail-safe connection. Additionally, the VRRP protocol enables redundant connection of the outstations via 2 different routers. It is possible to restart the device remotely via SMS, by phone or timer. The DSR-211-L is used for monitoring water, gas and electricity networks as well as for securely transmitting data for POS terminals and ATMs, video and media transmission (digital signals) and the remote maintenance of vending machines and other industrial machines, plants and equipment. When LTE is unavailable, backwards compatibility of the router to the UMTS, GPRS and EDGE data services in 3G / GSM networks provides the highest level of availability. Ethernet-based systems can be connected to the Internet quickly and easily due to integrated ethernet interfaces. 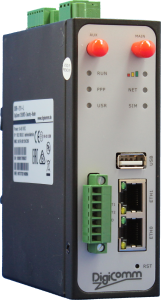 The LTE router is also fitted with a RS-232 or RS-485 screw connection. These interfaces can be used to connect serial devices as a modem or VirtualCOM port.